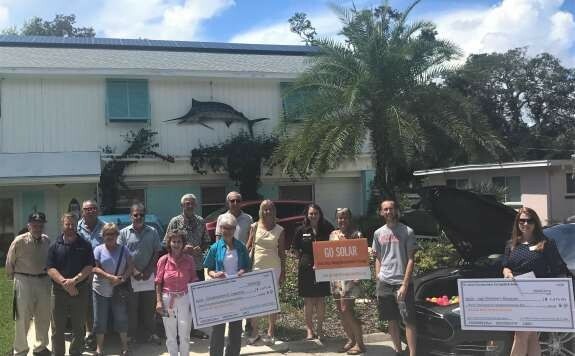 St. Augustine, FL - Neighbors in St. Johns County joined together last year and formed a solar co-op to save money and make going solar easier, with the help of non-profit Solar United Neighbors. Participants used a competitive bidding process to choose A1A Solar, of Jacksonville, to install solar systems for the group’s homeowners. Included in the company’s bid was a pledge to donate a portion of the revenue it earned from the co-op to local charities. At the co-op’s completion celebration, A1A announced a donation of $7,350 to be split between Compassionate St. Augustine, the lead local organizer of the solar co-op, and the soon-to-open tag! Children’s Museum of St. Augustine. More than 200 residents learned about solar energy and 49 homeowners installed solar energy with the help of the co-op. This resulted in more than $893,000 invested into the Northeast Florida economy and 16.85 million pounds of carbon emissions offset.